I received 3 Christmas letters this year, and it got me thinking that the Christmas letter is a dying art form that will be missed a decade down the road and will see some kind of a revival through an app, no doubt. But it also reminded me that I haven’t done any sort of Family Summary in recent years. We all gasp and groan about how quickly time flies, and every November hits us rudely that Christmas / New Year / Chinese New Year is “just around the corner”. I don’t know if it’s age or mundanity that prevents me from remembering what I did last week, let alone what I did in January this year. And yet I remember how I used to savour dates and moments as a teen – relived the special ones over and over through dear-diary entries and long phone conversations and letters to friends secretly penned during Math classes. I remembered everything in minutiae, with excruciating detail. I swore to myself that I’d never forget. And indeed some of those moments are still scorched into the lining of my brain, images vivid as when I was thirteen. I say all this, because I don’t want to forget this year. I first came across the concept of Brutiful from Momastery, who probably got it from a Death Metal band that apparently first coined the portmanteau. Brutiful – this exquisite, tortured mix of the brutal and the beautiful that makes you want to cry for too many reasons, and so you do. Well, Life this year has been Brutiful. The centrepiece, of course, has been my mother’s death – except it wasn’t just the death we survived, but the dying. My cousin Andrea had asked me very recently how I was holding up, and we both agreed that there is a distinction between Okay and Happy. I’m okay. I cannot say I’ve been happy. I am coping. I have been surviving. But I’m not quite sure about thriving. I’ve certainly been moving as fast as I can to get the practicalities sorted – the house packed, sorted and cleared… the estate lawyered up and managed… the thank-yous written, the friends hugged and comforted. 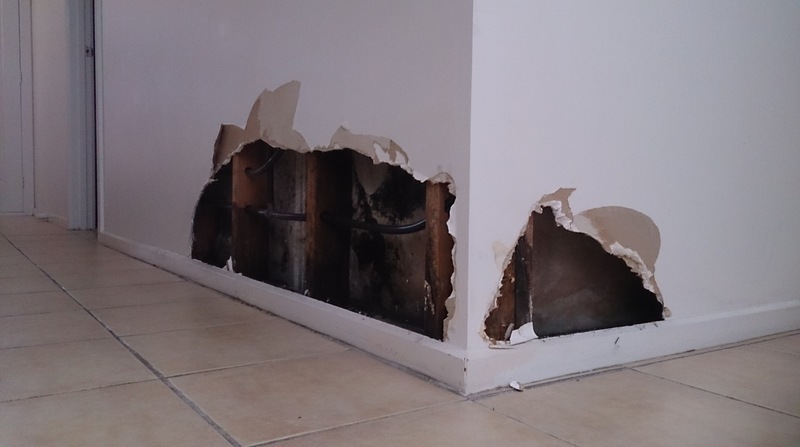 The giant upheaval of jumping into the unknown and foisting a mini-migration on my family, only to move back 3 months later and do the reverse. The logistics of shipping back 10 moving boxes into a house already full, and unpacking all over again. The idea was to start the healing process by ripping off the bandaid quickly. I come from very pragmatic stock. But I had not been prepared for the internal injuries that come about from actually watching a beloved die. I don’t know why it hadn’t dawned on me before, but watching any death take over a life is traumatic. I know my mother didn’t get bludgeoned to death by an axe murderer or hit by a bus before my eyes, but the moment of her death touched the very core of me and something in there shrivelled up and died with her in that moment. For months now, I’ve found every memory of my mother very painful – all the good bits, all the neutral bits, all the horrible bits. Just simultaneous excruciation for the mind and the heart that is constantly there. I cannot stop thinking about her. She is in everything I do and see and touch. But I am constantly shaking my thoughts – and sometimes, literally my head – because it hurts like nothing I’ve ever felt before. I’ve realised that I’m still traumatised. It’s not a dramatic thing, this trauma. But I just can’t separate the moment of her dying from everything else about her. Sometimes, I can’t even breathe. 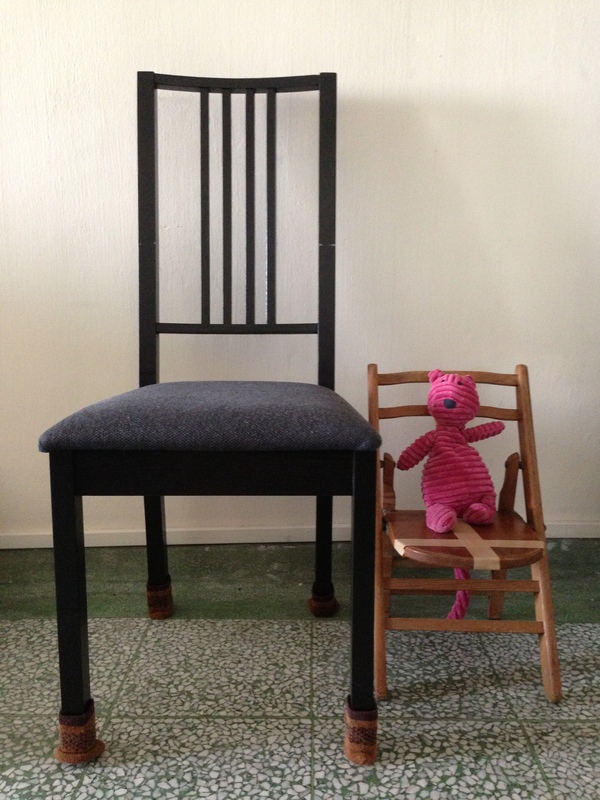 Right: My wooden folding chair. Split down the middle and not worth the hassle with Australia’s Customs department, this was one of many childhood relics I had to leave behind. At least Arddun got to use it while she lived in Singapore. I managed to injure our brand new car twice in a matter of weeks at the beginning of the year. Once in January, when a random Real Estate sign on a picket flew across the road during 70kmh winds and hit my side door while I was driving, and then a few weeks later when I backed into a sign post because I couldn’t hear the reverse warning beeps over my music collection of Screaming White Females. I had to have my root canal redone by an endodontist, and then stop treatment halfway to race back to Singapore to be with my mother, and then resume the second half of my treatment when we returned in June. And then get a tooth cap done by a family friend – and Queensland’s smiliest, chattiest dentist – when we visited Tony’s parents shortly after. We visited Tony’s folks in Brisbane, where Arddun got to meet her cousin for the very first time. And then we went to Fiji for a family holiday, where we stayed at the Sheraton and ended up surrounded by Australians anyway. I spent, in total, 4 months of the year in Singapore over 3 visits – three months with Tony and Arddun when we mini-migrated there in March to be with my mother before she died, two weeks with just me an Liz to sort out her estate, and a precious week where I travelled alone to be with my mother just a fortnight before she died. Celebrating my 34th birthday with mum. She had said this would be her last chance to celebrate my birthday. In so much pain, even though she was smiling. We’ve dealt with The Big C twice in our family this year – my mother’s ovarian cancer is the obvious one, but my aunt – her sister – discovered her breast cancer this year as well. And so it’s been an exhausting year for her twice over, and us watching as she goes through her gruelling treatment without her best friend by her side. It’s also meant a lot of visits to GPs and ultrasound clinics for me, as I start the process of attaining genetic counselling. I’ve also seen the inside of my ovaries three times this year. And no, I’m not pregnant. Number of times people have asked when I’m going to get knocked up again: 54. That’s more than once a week, people. I had extended my maternity leave, and then told work that I’d like a change of scenery so they created a new job for me, and then I accepted the job… only to quit the week I was supposed to start because we decided to drop everything to be with my mother . And they were absolutely lovely and loving about me inadvertently stuffing them around like that. Just crazy-understanding and well wishes all around. Tony changed job scope, and then Australia changed government, so all his work eventually had to ground to caretaker mode, and now everything’s different. Because that’s life in the public service – or at least, that’s the way it is when there’s a changing of the guard. 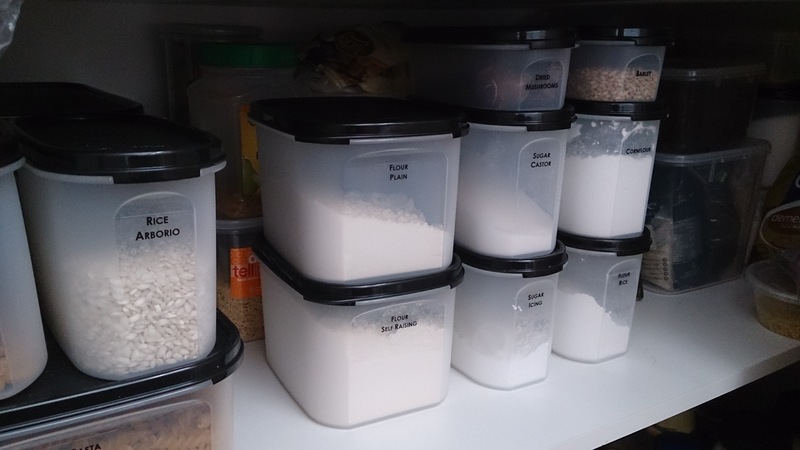 I started selling Tupperware – partly to get out of the house and wear heels, partly to feel like I can earn some extra cash, partly because I’d like to organise my kitchen pantry with free stuff. But in the meantime, I’ve managed to reconnect with people I haven’t properly spoken to in years, and meet new people from very different walks of life. And I’m now running out of space in the guest room – my one remaining bastion of clear floor with no clutter – because it’s filled with Tupperware. Organisation can be a beautiful thing, no? The day before my third trip to Singapore, I realised the carpet in our walk-in robe was damp. About 7 tradesmen later, we learnt that our shower tap in the ensuite had been secretly leaking into our walls so it got all soggy, and then the shower recesses in both bathrooms were probably also leaking water, and then the insurance company won’t cover any of it because they don’t cover shower recess leaks even though the majority of the damage was caused by the shower taps, and… and… 10 weeks on, we have a gigantic hole in our wall, and a fight with the insurance company whose disputes department has the response time and energy of a drugged sloth. Remember this one? Still there. Still big. Still ugly. 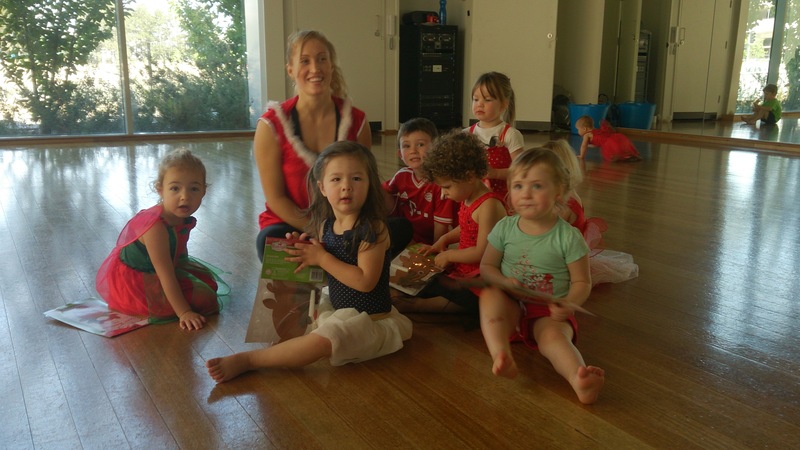 Arddun started dance classes for the first time, and loves it so much that we’re doing it again next year. 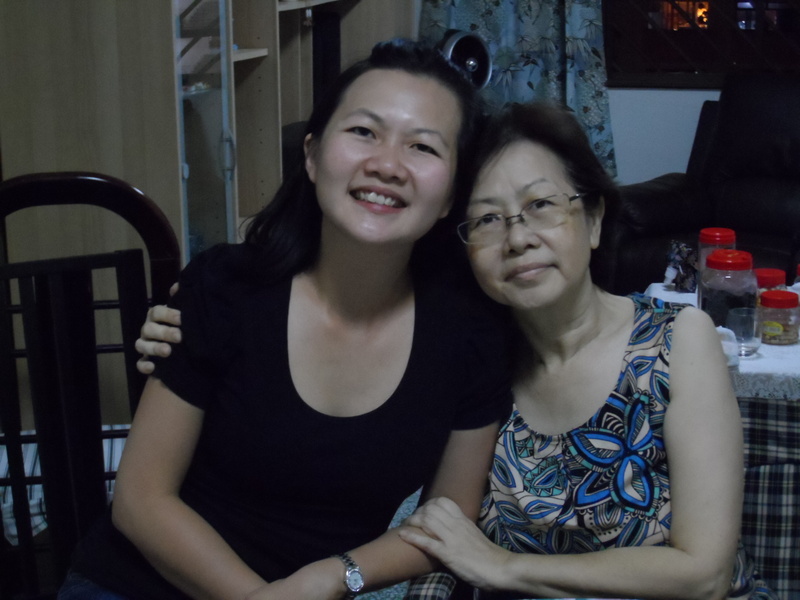 Thanks to sleeping arrangements in Singapore, she’s learnt how to sleep by herself on her own bed – even if that means rolling off it in the middle of the night, and then groggily climbing back in. 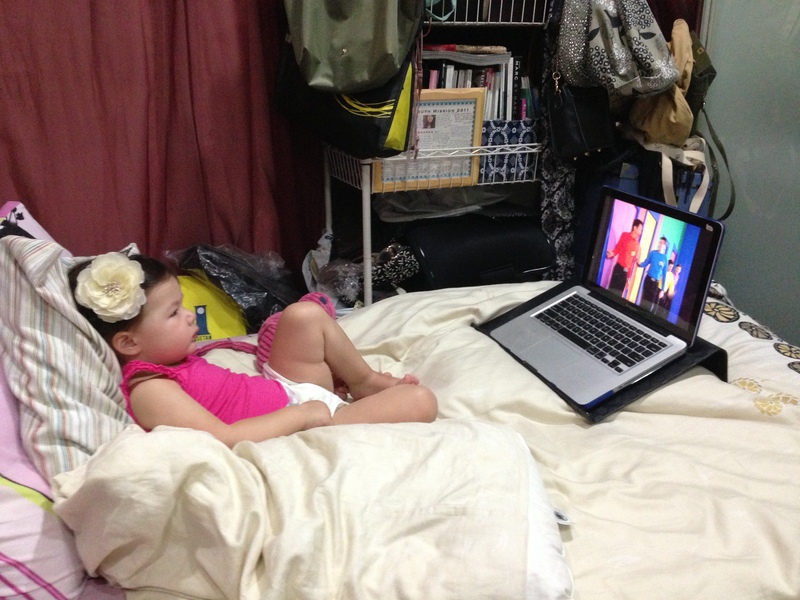 Life is pretty sweet when you’re on a Big Girl Bed. She’s drunk orange and apple juice for the first time, and so now she’s demanding that it’s a staple in her diet even though I’m fighting it because water is so much more important. She brushes her own teeth with REAL grown-up toothpaste that requires her to spit after vigorously and randomly rummaging mouth with brush, and that has a picture of The Wiggles on the tube. She now also loves skirts, partly because it reminds her of dance classes, but mostly because it’s the one article of clothing she can put on herself without getting it too wrong. 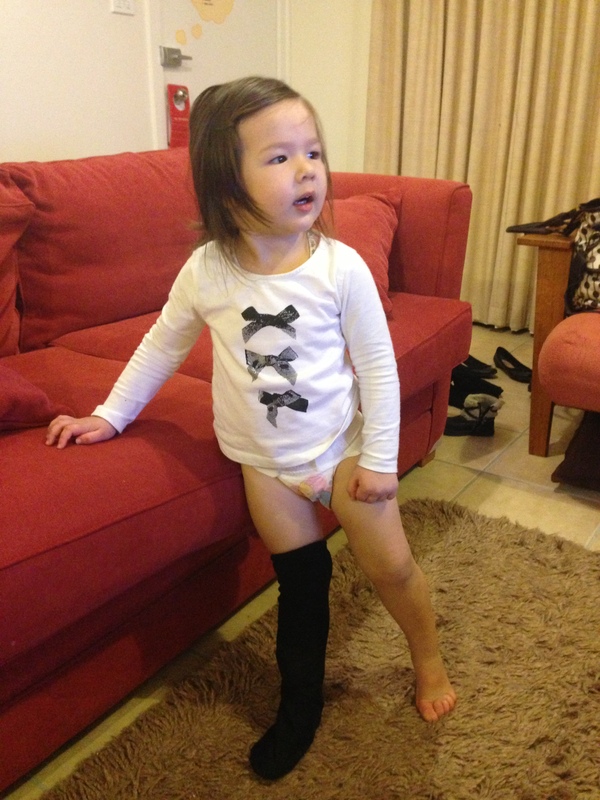 She likes dressing herself, and is getting better at it all the time. 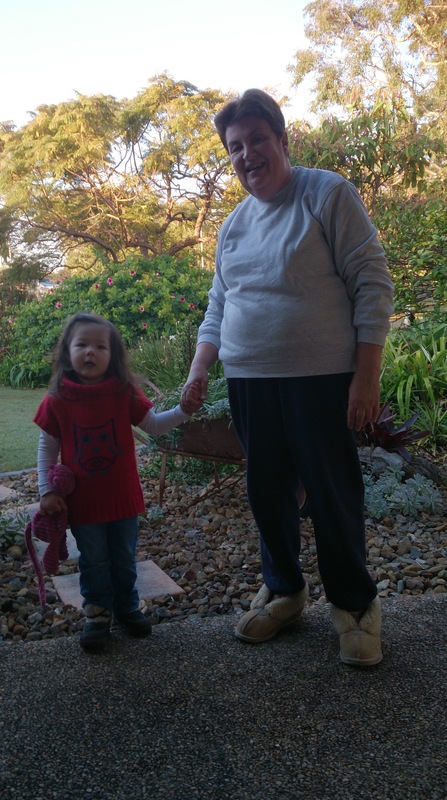 Arddun also got to see her Poppy and Nanna a whopping THREE TIMES this year – once in Singapore for Grandma’s homecoming, once in Brisbane, and once when they came over to stay in Canberra so I could fly to Singapore with Liz to settle the Singapore estate. 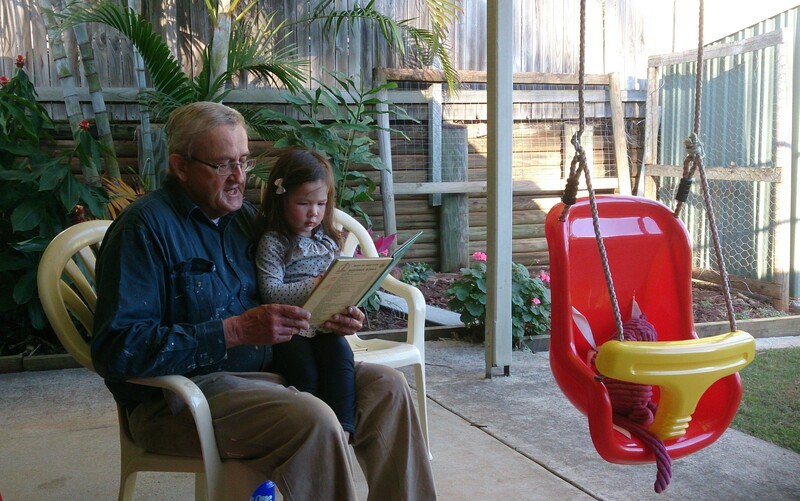 Reading with her beloved Poppy. The red swing was hers and Little Kitty’s very favourite means of passing the time. 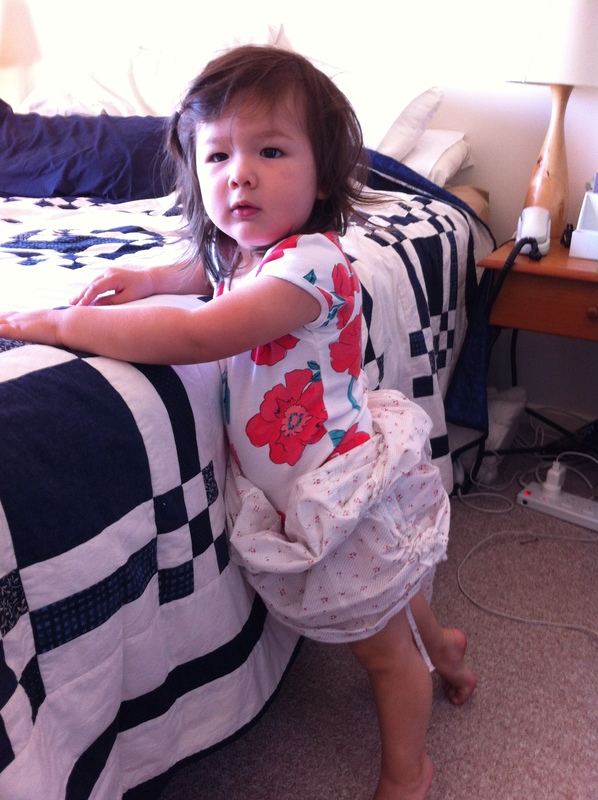 Arddun still yells for “Nina” when she gets in trouble with Mummy and Daddy. As for our holiday season this year, we took a quiet day trip to Malua Bay, and Arddun got to spend some time “at the sandpit”. We had to teach her that this giant sandpit is better known as A Beach. Her very first time at one! 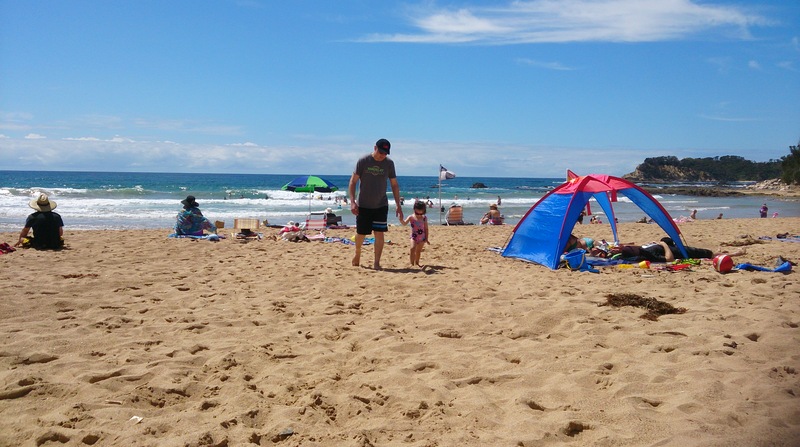 Beautiful day for sandcastles, Daddy. We also spent a day at Camp Challenge – Arddun’s very first Australian church camp, and our first time in a decade. 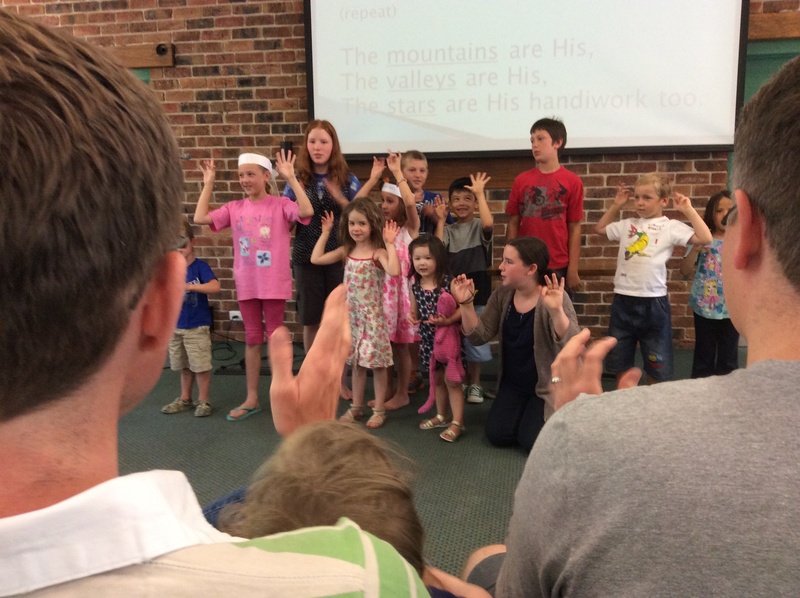 Singing “My God is So BIG!” at Kids Worship. 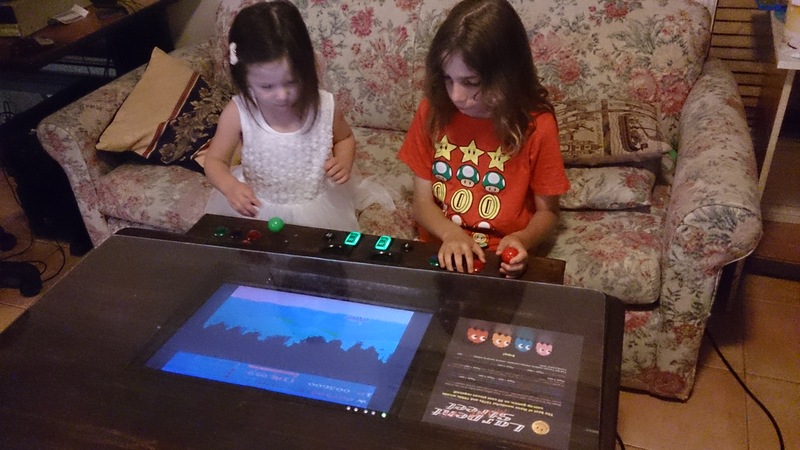 And then we had dinner at Tony’s colleague’s home this evening, where Arddun got introduced to the joys of Atari gaming without needing to shell out a roll of 20-cent coins. I’ll be honest: this year SUCKED the BIG TIME. Part of the back of my throat feels perpetually contorted from swallowed tears, like I just snarfed a bag of Super Lemons. It has been exhausting. It has been stressful. Parts of it has even been hateful. I want to say there are lovely bits, because it’s true. I want to say that I’ve been surrounded by some of the best quality people Life has to offer, because that is also definitely true. But I would do this year over in a heartbeat, if it means I can spend more time with my mother. As i reflect upon the year, i’m thankful for all the pain and uncertainties in 2013, for they remind me that i’m still human and i can still continue to hope and trust in a perfect God who holds my tomorrow. I couldn’t have said it better. And I probably should. So I’ll leave it as that for now, and bid you a Happy New Year.